With the change in weather, we have fancied a few lighter meals in the evenings. Last night the girls helped me make healthy turkey pitta pockets served with an array of crunchy salads and Manomasa premium tortilla chips. It was such a quick meal to prepare, very summery and both the girls could get involved. In a big mixing bowl, squish together the turkey mince, black pepper, spring onions, chilli powder and tomato puree. Lara hates getting her finger dirty, but Holly loved kitchen activities like this! Form the turkey mix into about 10 small patties and flatten them slightly to less than 1 inch thick. Heat a large non-stick frying pan. You can cook these with or without oil - they will take longer to cook without oil. Fry for about 4 minutes on each side. Check one of them is cooked all the way through before serving. Lightly grill the pitta bread before serving. The best way to serve this meal is to place the tortilla chips, cheese and salad in bowls in the middle of the table so that your children can help themselves. Give everyone a pitta pocket and a turkey patty and then let them loose on the crispy bits. 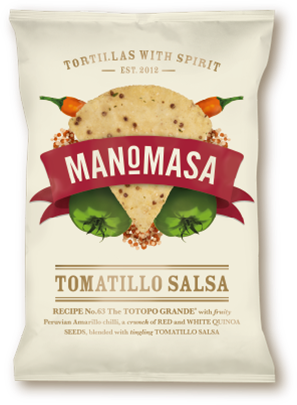 Manomasa premium tortilla chips come in a range of shapes and sizes with some exciting flavours (which you really can taste). 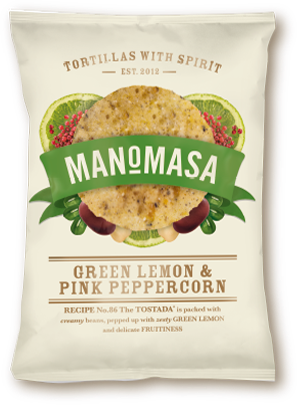 Our family favourites were the Green Lemon and Pink Peppercorn traditional tortilla chips which we all LOVED. 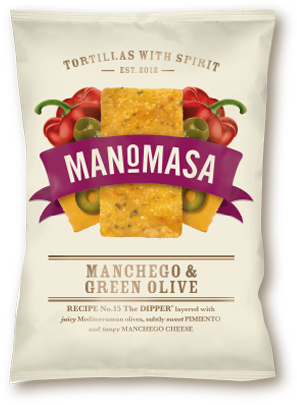 You can find Manomasa chips in Waitrose, Whole Foods and independent delis.